From deviled eggs to Easter traditions, hard-boiled eggs are versatile, simple, and nutritious. With an average of only 70 calories per egg, they are low in fat and high in essential vitamins, minerals, and other nutrients, including lutein and zeaxanthin, both critical carotenoids for healthy eyesight. The majority of healthy substances are found in the egg yolk, along with over one-third of the egg's total protein. Eating a healthy diet is a must for strong muscles and can help create a feeling of fullness, helping egg-eaters control their appetite. Place eggs in a single layer on the bottom of a large saucepan. Fill the pan with cold water, fully submerging the eggs. Water should cover eggs by about one to two inches. Place pan on a cold stove and turn it on to high. When the water boils, turn off the burner and cover the pan. Set a timer for 14 minutes, and allow the eggs to sit in the water untouched until the timer goes off. Carefully remove eggs from hot water with tongs and submerge each in cold water for about five minutes to stop the cooking process. Refrigerate the eggs and use as needed. Use a single layer of eggs in the pot for boiling to avoid poorly distributed heat. Water should be approximately one inch over the eggs when cooking. Let eggs stand in hot water, rather than continually boiling, to avoid a rubbery texture. Pierce eggs with a needle prior to boiling to prevent cracks. Stir occasionally to evenly distribute heat while cooking. Place eggs in cold water first, and then bring to a boil. Do not attempt to hard-boil eggs in a microwave: the lack of ventilation could cause the eggs to explode. Chill eggs promptly in ice water to prevent discolored yolks (although the discoloration is harmless). Peel eggs by cracking them all around and rolling them between your hands to loosen the shell. 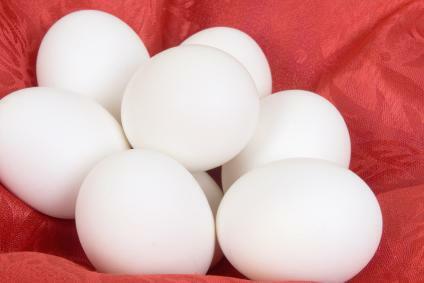 Refrigerate hard-boiled eggs in their shells for up to a week before using. Use a marker to differentiate between hard-boiled eggs and raw eggs if they will be stored together. 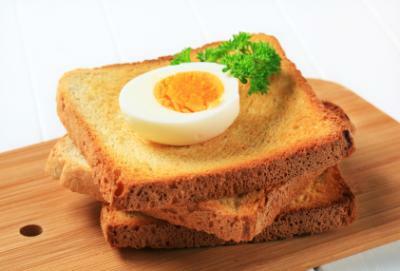 Hard-boiled eggs can be used in a number of recipes, including appetizers, salads, spreads, sandwiches, and more. As part of the meat, poultry, and fish food group, eggs are an important part of a healthy, balanced diet. Despite their simplicity, they never need to be bland or uninteresting in a recipe.